Found 11 file extension associations related to Amaya and 9 file formats developed specifically for use with Amaya. 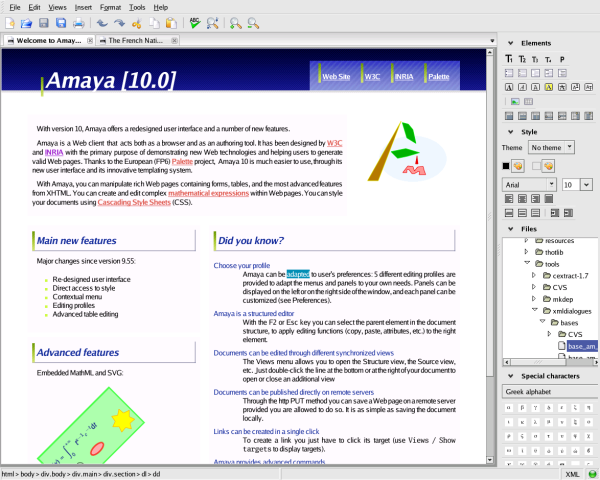 Amaya is a complete web browsing and authoring environment. Using Amaya you can create Web pages and upload them onto a server. Authors can create a document from scratch, they can browse the web and find the information they need, copy and paste it to their pages, and create links to other Web sites. All this is done in a straightforward and simple manner, and actions are performed in a single consistent environment. Editing and browsing functions are integrated seamlessly in a single tool. Amaya always represents the document internally in a structured way consistent with the Document Type Definition (DTD). A properly structured document enables other tools to further process the data safely. Amaya allows you to display the document structure at the same time as the formatted view, which is portrayed diagrammatically on the screen. Several (X)HTML, native MathML (.mml) and SVG (.svg) documents can be displayed and edited at a time. The editor helps you create and text out links to other documents on the Web from the document you currently are working on. You can view the links and get a feel for how the information is interconnected. This feature is not limited to HTML anchors. With XLink, any MathML and SVG element can be a link too. Annotations are external comments, notes, remarks that can be attached to any Web document or a selected part of the document. If you need more information please contact the developers of Amaya (W3C), or check out their product website.